At a business meeting, a woman walks my mom into an office and introduces her dog, Chelsea, a black-haired Chihuahua with slightly less desperate eyes than the breed generally sports. The dog is posed on the desk, among the paperweights and pens, stuffed and mounted on an armature. Chelsea passed away three years before and has graced the office desk ever since. “She used to love to sit at my feet while I worked,” the woman sighs, tracing down the dog’s spine with a few fingers. At least this is how I imagine the business meeting went. My mom came home afterward to announce that Agatha, our corgi mutt, would be stuffed post-mortem. Not our other dog, Milo, who is neither as soft nor as spirited, but instead quite neurotic. I was sitting on the couch with Aggie and covered her ears as I objected strongly. She was still able to sense my tension and jumped off the couch to slink under my mom’s bed. This is the mother who went vegan ten years ago, after reading a book titled Thanking the Monkey and who can’t stomach even hearing about roadkill. Although immune to my mom’s wish to preserve my dead dog’s body, I similarly don’t know what I will do without Agatha. One morning, waking up with Aggie curled under the covers next to me and suddenly desperate at the thought of losing her, I looked up dog cloning. In ancient Egypt, animal mummification was common practice. The bandaged animals often look like heads protruding from cylindrical bodies, akin to PEZ dispensers. Their faces have eyes and snouts drawn onto the contours of the cloth, effecting an eerie doubling. Some animals were household pets mummified so that they could spend eternity with their owners. Others were bred specially to be killed and mummified as sacrifices to the gods. In ancient Egyptian society, animals were so highly regarded that peoples’ treatment of them largely determined whether they would be admitted into the afterlife. My mom’s interest in taxidermy does not subscribe to such holy ideals; the preservation of our dog will not ensure my mom an eternal afterlife with Agatha. Instead, it seems to serve a much darker purpose, hanging on to the external body of the being—the shell of my dog—where her only comfort is found in the feeling of Aggie’s fur stretched over stuffing. With fake glassy eyes and her favorite toys scattered at the foot of her perverted alter. I assumed my mom’s announcement was a knee-jerk reaction to her recent divorce. But five years after the fact, she is still adamant. I suggest compromises: burial in the yard, with some decorative stones marking the spot; cremation and a blowing to the wind on the favored hiking trail. Grief is one of the most common and intolerable afflictions, and when given the chance to work around it, it seems like many people will. In 2012, Animal Planet aired American Stuffers, a series that followed the Arkansas-based company Xtreme Taxidermy and ended each episode by reuniting an owner and their newly-stuffed beloved. It was canceled mid-season, after “The Yorkie a Hawk Tried to Carry Away” was aired, but before “The Cat Without a Nose” got any screen time. Across Animal Family Pet Preservation’s Facebook page, many of the dogs and cats are posed as sleeping—as though reminding us of their eternal sleep, or maybe because no soul can be found behind a pair of replica glass eyes. I also learn that some owners dye the hair on their pets’ faces to make them appear younger. One of the posts shows a dog posed sitting comfortably on a couch, its head lifted and ears perked at attention. The caption reads, “When i took this photo of Nikki, i noticed as i was posting it that there is a reflection of her in the coffee table. I guess that’s an appropriate way to describe pet preservation…its a reflection of the animals life. A beautiful, tasteful, and dignified reflection that brings peace to those who understand that love doesn’t end at death” [sic]. Taxidermy may be a type of reflection, but it’s difficult for me to understand how it elevates itself from photography. Photographs, which also blur the boundaries between life and death (for it could be said that once a photo is taken, the subject that appears in it no longer exists as it did in that recorded moment), do so at a certain distance from the subject. Victorian families with the means to be photographed would pose dead children for lasting portraits to remember them by—a virtual suspension of decay. I do not understand the wish for a physical one: sure you can pet the object, but you feel death with every touch. What is in this memory that cannot be captured in a perfectly lit image or a heartwarming video? My friend recently texted me a GIF she made from a video of her dead dog. It blinks nobly, and endlessly—handsome as ever, forever. For the taxidermy skeptic like myself, this is where dog cloning comes into play. Why reanimate or preserve a dead loved one, when you can just recreate them? Sooam, a dog cloning and research facility in South Korea, is at the forefront of the pet cloning industry. The homepage of its English website informs visitors that “Sooam not only performs dog cloning research, but we also heal the broken hearts.” Right under this is a highlighted list of instructions for cooling your pet (wrap in wet towels and place in your fridge, not your freezer) and retrieving viable live cells after death. For the nominal sum of $100,000, Sooam guarantee you a replacement within five months. Seeing how much can go wrong during this complex process, scientists incur simultaneous pregnancies in order to ensure at least one “good egg.” Sooam claims a success rate of one in three surrogate dogs’ implantations and states that most abnormal pregnancies terminate early on. However researcher Rudolf Jaenisch, speaking to Vanity Fair in an article about dog cloning, said he finds its numbers unlikely. He states there are likely to be many genetic deformities with the embryos since “new” life is being created using DNA from old pets, which, after the course of their lifetimes, is more likely to have epigenetic abnormalities. Because of the multiple pregnancies, it is likely that customers will receive more than one clone. Streisand got her and Samantha’s smiles back, but at more than just a monetary cost. The toll that that grief exacted on her was exchanged for stresses placed on the dogs whose eggs are harvested, whose bodies are rented for reproductive purposes, and who are bred into sterile existence for the purpose of attempting to recreate a bond that has been irrevocably lost. Most remarkable of all, the calculations made by dog cloning clients is this: the lifespans of the clones are still uncertain, since most of the existing ones are still in their single-digits. I am unconvinced the replication is worth it. It seems that the clones, imperfect recreations of an ideal, cannot be defined by anything other than their deviations from the original model. Clones are necessarily marked by loss, always missing pieces of their originals, and their owners must consistently be reminded of this painful difference. This wouldn’t be the case if cloners instead chose to adopt one of the many dogs left for dead in shelters. Yes, they would still grieve, but they would not see their dead dog constantly in their new one. Rather, they would gain the space to forge a new, meaningful relationship—one that isn’t predicated on the disappointing inability to live up to a previous lifetime. For more than simply health reasons, we would not keep freeze-dried or taxidermied versions of our deceased human loved ones in the corner of our living rooms. Nor would we clone our mother after she passed away, to raise her body again from birth with new memories, a new personality, and a completely different relationship to us. When forced to, we can put our loved humans’ bodies to rest. However, should human cloning come about, the urge we see with animals to suspend or ‘reverse’ death could apply to our bodies as well. (People have already been cryogenically frozen in order to be reanimated if or once the technology to do so develops.) 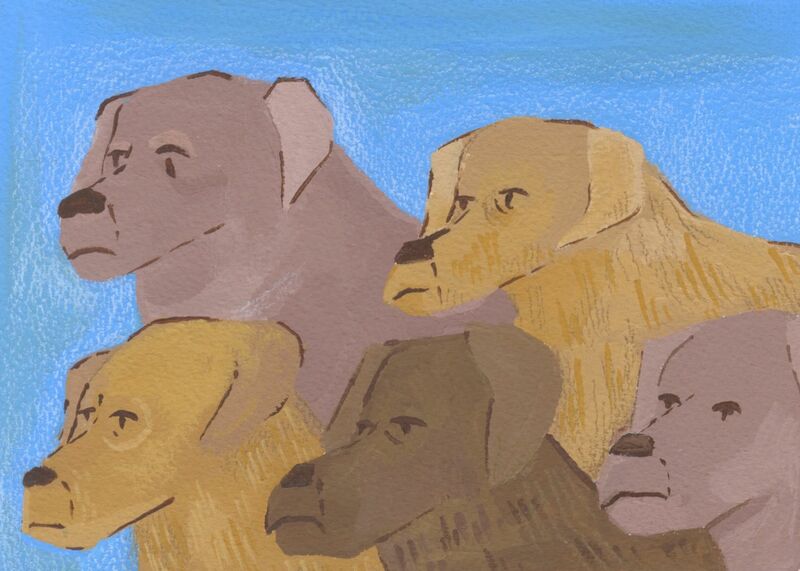 For now, though, we only attempt to circumvent grief’s potent effects with respect to our animal companions—bending the conventions surrounding death. We can do this, in part, because the animal-human relationship is already a fantastical one: predicated on a love that is pure yet conditioned­, dominant and subservient, protective and protected, and most importantly, unspoken. EMMA KOFMAN B’20 should not be preserved in a jar.